Cloetta Dental is located in Smith’s Plaza with convenient and ample parking. The entire office and parking lot are handicapped accessible. We are committed to our patients’ comfort and dedicated to the highest quality of dental care. Dr. Cloetta and her staff participate in frequent continuing education courses, and embrace the latest in dental technology. Your entire family will find a welcoming atmosphere and qualified professional attention by a team that is always happy to see you. Schedule an appointment and experience how Cloetta Dental can help your smile! Dr. Cloetta grew up in Dallas, Texas where she graduated from Baylor College of Dentistry. Before moving to Wyoming in 1997 with her family, Dr. Cloetta maintained a private practice in Plano, Texas. In 1986, she was awarded the Young Dentist of the Year from the Dallas County Dental Society. After arriving in Jackson, Dr. Cloetta continued her commitment and passion for her community and profession. She is an active member of both the American Dental Association and the Wyoming Dental Association. Her volunteer activities have included the Jackson Hole Wildlife Foundation, St. John’s Living Center, and Our Lady of the Mountains Catholic Church. Dr. Cloetta also volunteers in many charitable dental outreach services. 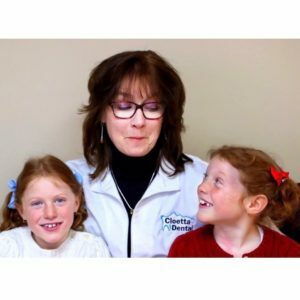 An outdoor enthusiast and devoted family person, Dr. Cloetta is committed to providing excellent dentistry in a relaxed and comfortable setting.